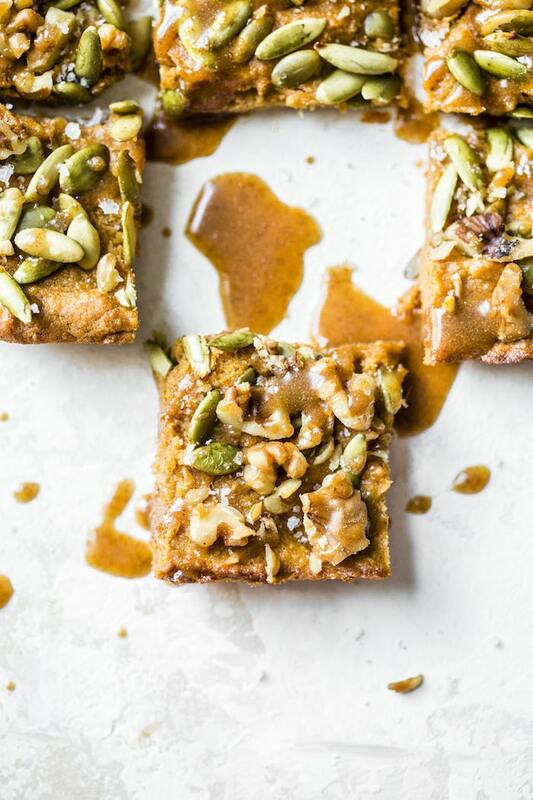 These Paleo Sweet Potato Bars are made with mashed sweet potatoes, almond flour and topped with a sweet maple almond drizzle. Ohhhhh, ahhhhh— a sweet potato bar! You’re intrigued, right? 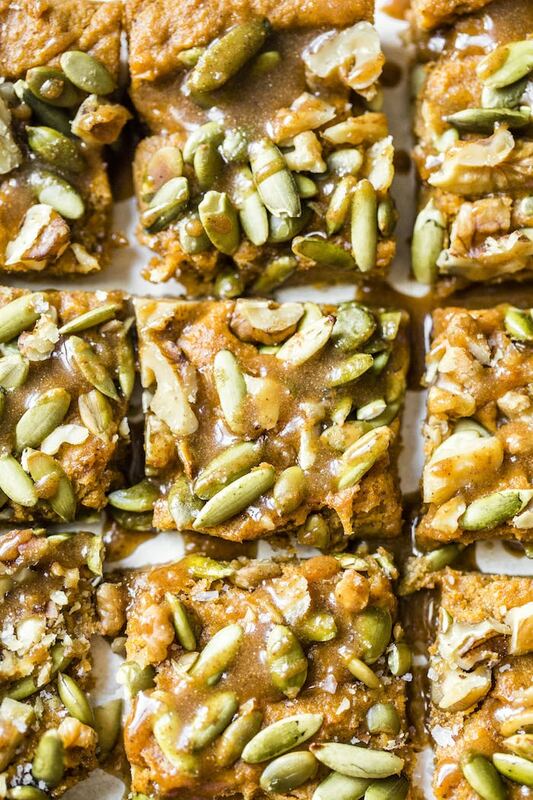 These paleo sweet potato bars are a tad smaller than traditional dessert bars, making them the ultimate guilt-free fall-flavored snack (say that 5 times fast!). I’ve been going sweet potato and butternut squash crazy this year—I can’t get enough! I’ve been trying to use them in several recipes including enchiladas and muffins and now in snack bars. For reasons I’m still unsure of, I decided to make these bars paleo by using almond flour instead of my go-to all purpose flour. I find almond flour to be the easiest paleo flour to work with and I think it tastes pretty good too, but I also haven’t tried all the different kinds of flours so what do I know? Do you have a favorite paleo flour? If so, tell me! So these sweet potato bars are awesome, though at first I was like “hmm… these don’t taste as sweet as much of my recipes usually do.” But, I decided that ultimately that’s a good thing because that way, they truly are more like a snack bar and less like dessert that leaves you in a sugar coma, though the maple almond drizzle definitely takes them up a notch on the sweet scale. 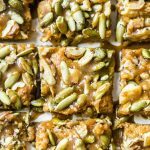 I opted to top the bars with walnuts and pepitas, though you could really top them with any sort of nut and/or seed—whatever you have on hand. These sweet potato bars are made with mashed sweet potato, and I found it best to cook the potatoes in a large pot of water over the stovetop, so once they’re cooked you can drain and mash them. In this case, I found it helpful to add a few drops of milk to the sweet potatoes so that they’re easier to mash up. 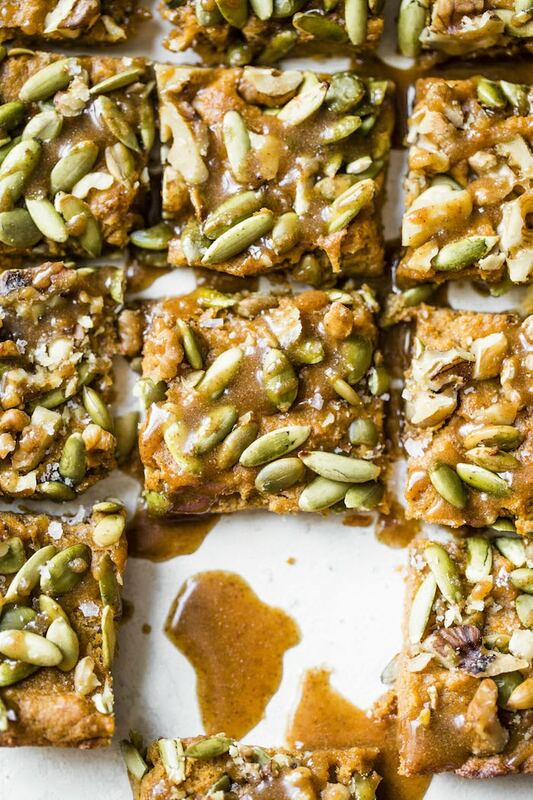 After that, you simply combine all the ingredients, bake the bars and then once they’re done and cooled, you add the maple almond drizzle (the best part!). Cheers to sweet potatoes, my newfound favorite food. 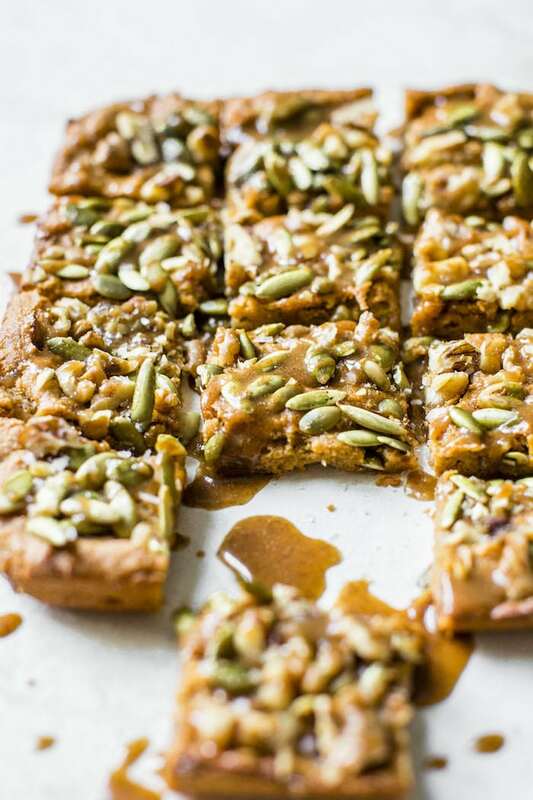 These Paleo Sweet Potato Bars are made with mashed sweet potato, almond flour and topped with a sweet maple almond drizzle. Preheat oven to 350°. Grease an 8×8 baking dish OR line it with parchment paper and set aside. Combine mashed sweet potato, egg, almond butter, and syrup in a bowl; then, add flour, baking powder and cinnamon and stir to combine. Scoop mixture into your baking dish, using a rubber spatula or spoon to smooth batter out, then add the walnuts and pepitas, using your hands to gently press them into the top of the batter. Bake bars for approximately 35 minutes or until a toothpick comes out clean. While bars are making, make the glaze: simply whisk almond butter and syrup together. Drizzle the bars with the glaze after cutting and before serving. **I recommend cooking 2 sweet potatoes and then mashing. You may have some leftover, but it’s better to have leftover mashed potatoes than not enough! I have made these at least five times and brought them to multiple different parties. They are always a HUGE hit! People always beg me for the recipe, especially when they hear about the healthy ingredients! Thank you for an easy, clean, delicious dessert dish! woohoo!! This makes me so happy and I’m glad you and your friends have been enjoying them.